Digital photography is clear, convenient and remarkably predictable. 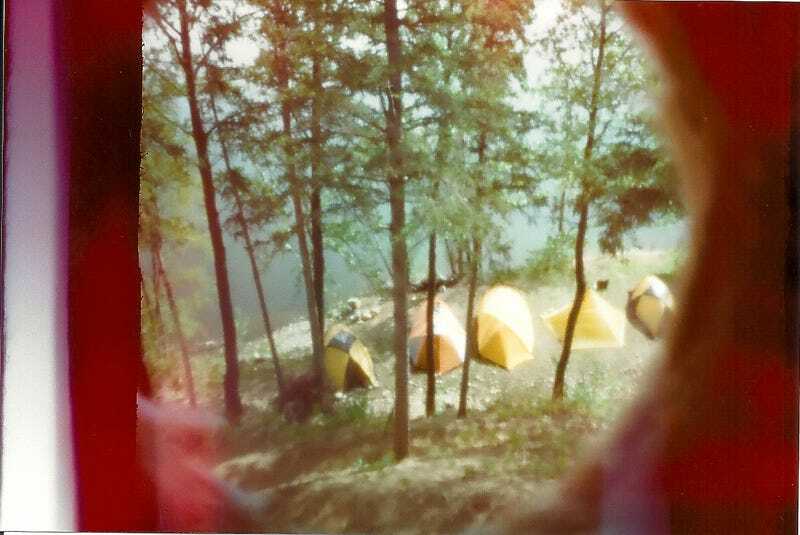 But film, particularly loaded into a pinhole camera, can be rough, murky and inherently retrospective. The 22 results of this Shooting Challenge are an excellent homage to the quirks of the medium. A few mountaineering friends are staying at our house and this is a shot of their tents down on our lake-front property in Wasilla, AK. I used a Canon Rebel T2i to take a picture of the pinhole camera and a HP Photosmart Plus scanner to scan the pinhole pictures. The pinhole camera was made with a USPS Priority Mail Flat Rate box. I attached the camera to the rear view mirror in my car and exposed the film while the car was moving. The shooting was at night. For this particular shot, I used the camera which is made out of a peanut can. I fashioned a film holder inside of the can using electrical tape, and the film plane is curved. This small local waterfall is rendered nearly abstract in this view. The film is Croatian Efke PL 25 sheet film developed in Diafine. Exposure was 45 seconds. Polaroid home made pinhole camera, with expired Type-665, cleared in mugi-cha. Thanks to everyone who participated this week in a particularly unorthodox challenge. Obviously, due to the nature of the medium, the results aren't as wallpaper-able as usual. But we've still updated our Flickr page with the latest entries, and the full gallery is below—complete with the homemade and modified rigs used to snag each shot.